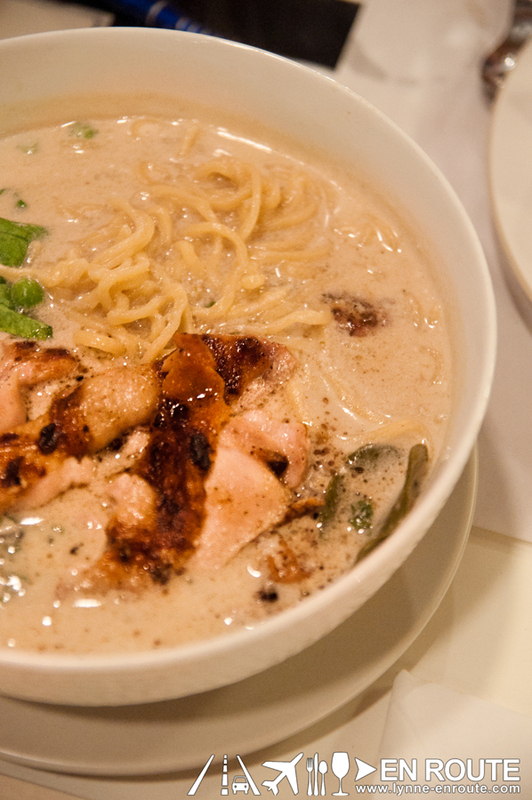 Metro Manila seems to be experiencing a ramen craze over the past few months. 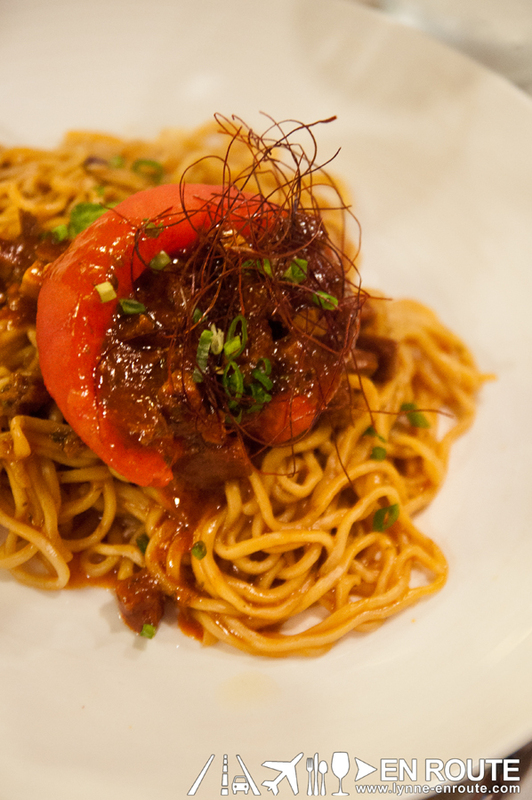 Restaurant concepts are difficult to come by, and sudden opening of home-made and franchised ramen joints with at least one per week may even look like a conspiracy by restaurateurs. 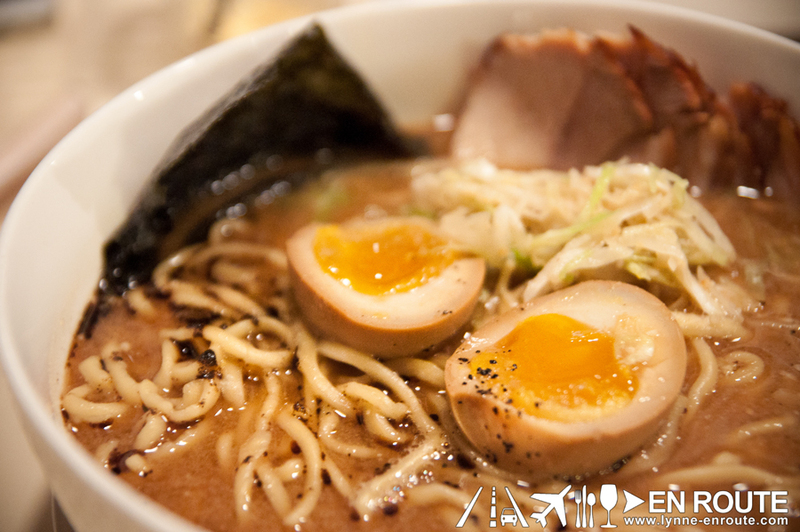 Ironically, something so original in ramen concept has been in the scene since 2011 and the approach feels more refreshing compared to the newer installed establishments. 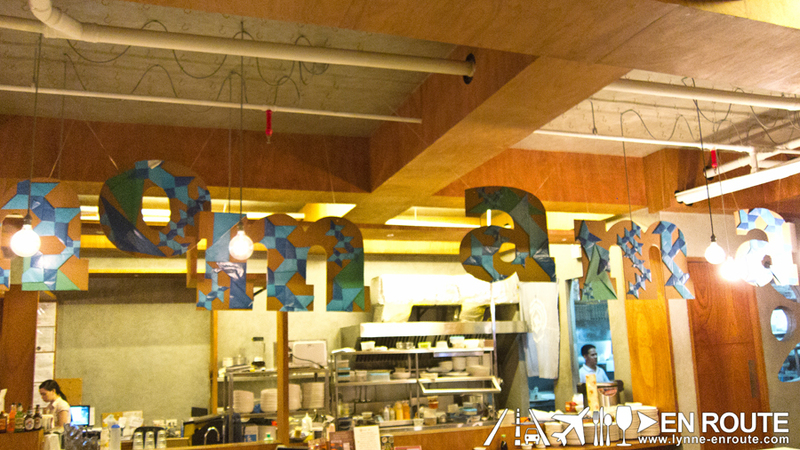 Nomama Artisanal Ramen in Quezon City is the brainchild of French trained chef Him Uy de Baron. 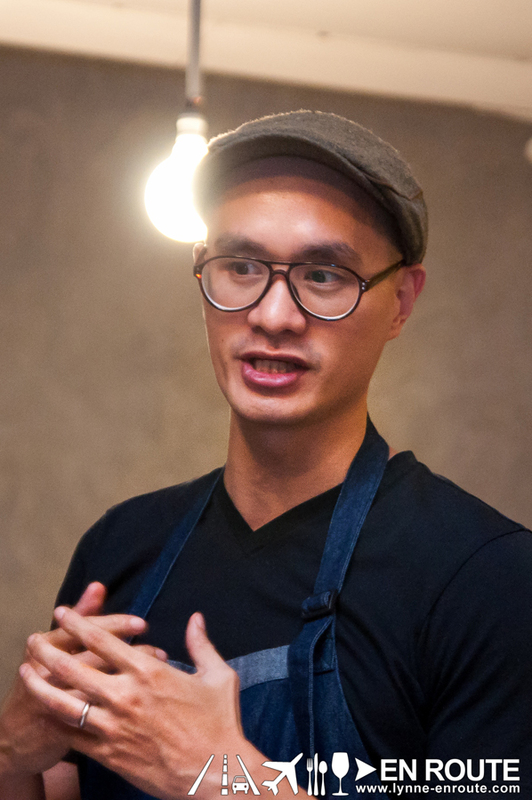 Instead of going through a tried and tested formula, the chef executed his vision of fusing the best flavors of the Asian region into traditional dishes, using as much as possible, locally produced ingredients only. The resulting dishes, therefore, partly become special because the flavors are mostly coming from the best of what the Philippines has to offer. 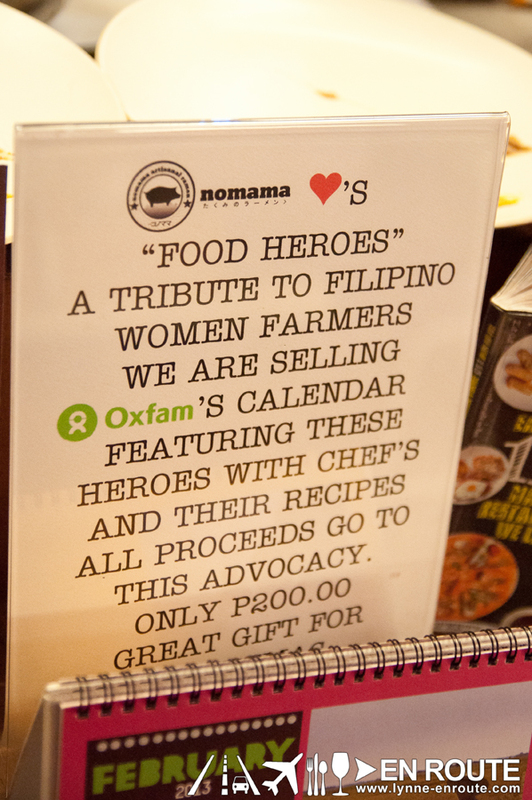 In fact, his advocacy towards working with the local farmers shows in his restaurant and the side items it sells. 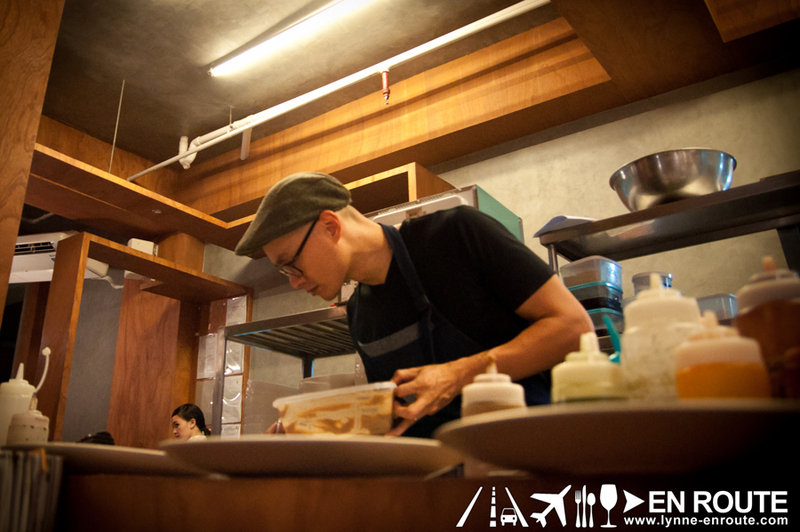 And when you watch chef work in the open kitchen, his advocacy translates in the intensity and passion in looking at the most meticulous details of every dish. 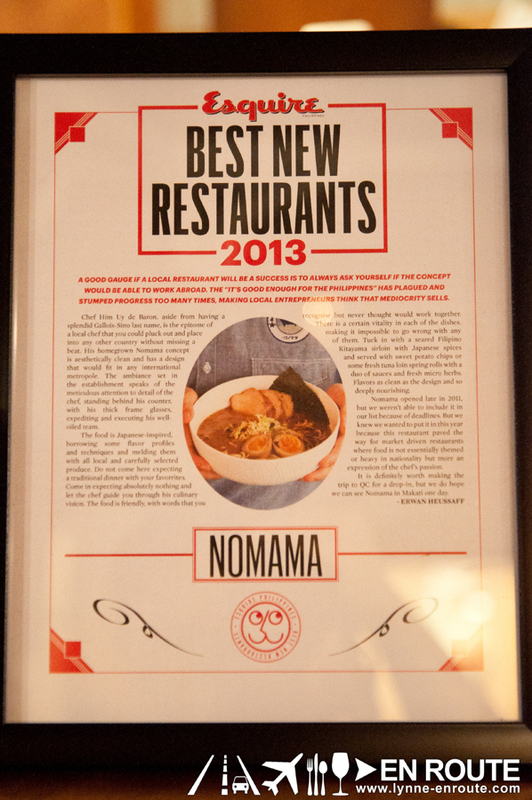 Nomama discloses immediately, though, that the menu is not going to taste like traditional or authentic delicacies that people may be used to by this time of the ramen craze in Metro Manila. You may find some traditional flavors for that pinch of familiarity, But you will pleasatnly also discover something that breaks away from the rest of the ramen pack. Nomama is not all ramen, though, and the flurry of appetizers and side dishes that are close collaborations from great ingredient providers, such as Kitayama Wagyu Beef from Bukidnon (the same supplier of the Wagyu Corned Beef of Mr. Delicious) and the Ministry of Mushrooms in Lipa, Batangas. 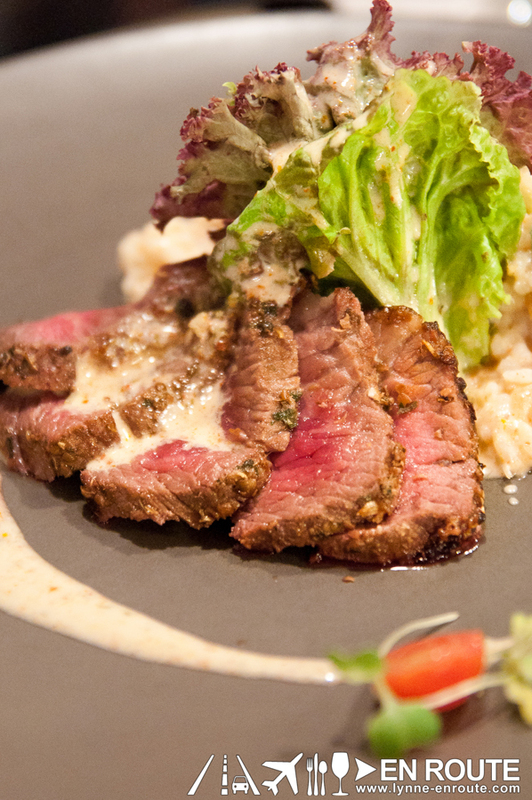 The Thai crusted Tri-Tip Steak with Jasmine Rice and Pineapple Salad highlights Thai flavors thanks to pineapple bits, The Tri-tip is melt-in-your-mouth soft, that you would wish there would be a larger, main-course version of this dish. 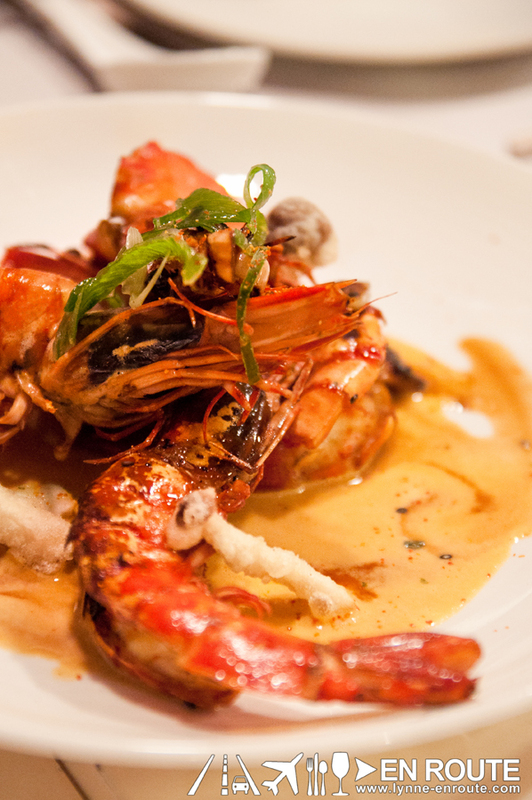 For seafood, a teppanyaki style prawn mixed with Uni Cream will have Uni lovers fighting for the last piece of shrimp. Uni is still very much an acquired taste for most people, so take in bits by bits of the briny delicacy with the shrimp. Fan of beef teppanyaki? Nomama’s beefy creation thanks to a Kitayama Beef Striploin has the same melt-in-your mouth texture but with added flavor thanks to its more fatty cut. And there is a vergetarian version, too, with the Vegetarian Mushroom Steak. Three kinds of mushrooms seared to imitate steak will be the non-meaty alternative. 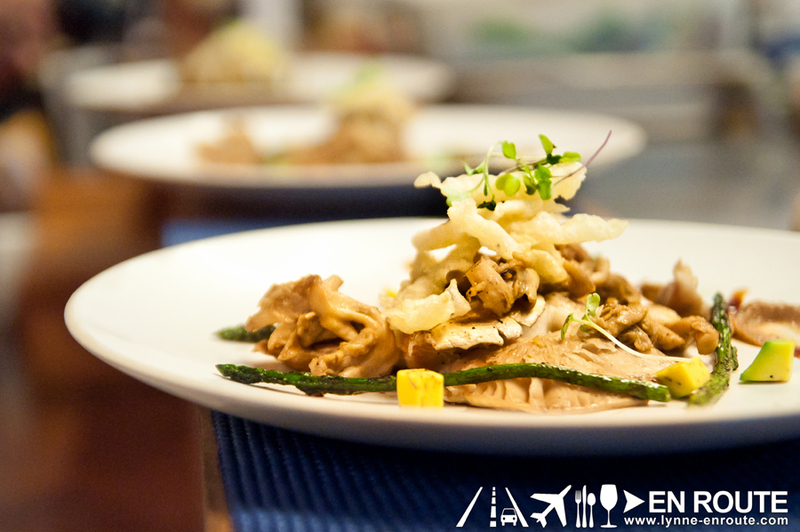 For this, it is the shiitake mushroom that is the highlight of the dish. Interestingly, some mushrooms may be of an acquired taste, too. Noodles are also on the menu. Their Dry Tongue Noodle draws flavors that are Korean in origin. The spice can be overwhelming, though. If you are one who likes smoke coming out of your ears, this one is for you. Otherwise, you can skip straight to the ramen. Thai Green Curry Ramen is the perfect example that shows that Nomama is serious about that non-traditional ramen recipes. It is not for everyone, as curry flavor is not immediately associated with slurping it as a soup, but it is an adventurous try. 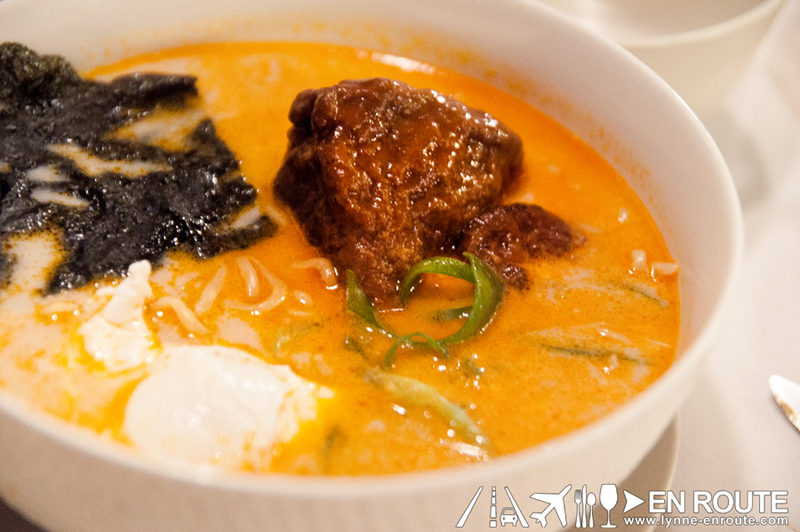 But if there is one ramen to get here, it would be the Wagyu Beef Cheek ramen. 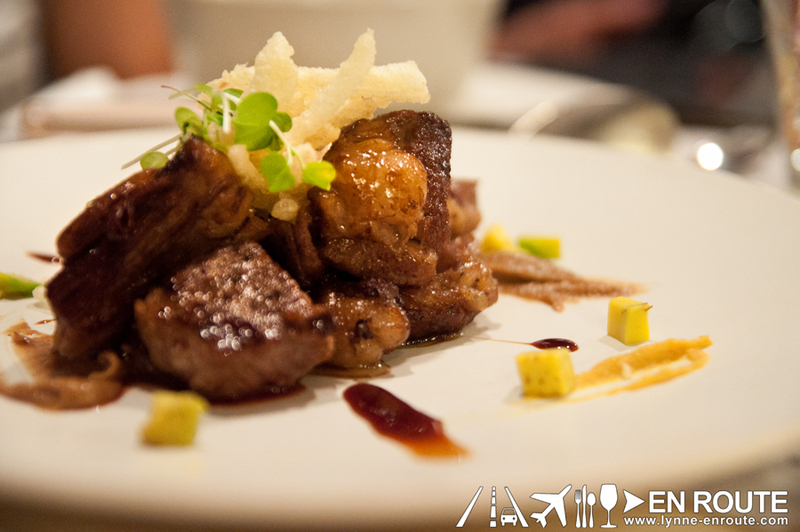 Instead of using the traditional char-siu pork, Nomama replaced it with a big, soft chuck of wagyu beef cheek. The savory flavor of the broth was the perfect partner to the bold taste of the beef. It is a definite crowd pleaser. 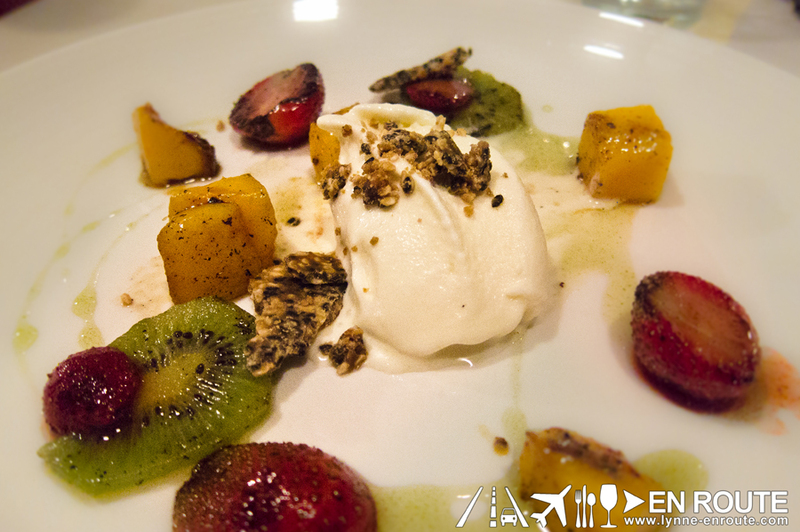 A dessert that can cleanse the palate would be gelato using kaffir lime syrup and fresh cut fruits. The kaffir lime’s citrus taste would make you mistake this to be sorbet or yoghurt. But it is definitely home-made gelato if you let the flavor linger in your palate to expose that familiar creamy taste. Clearly, Nomama makes no apologies for taking the road less traveled in showing what can be done to traditional menus if fused with inspirations from the Asian region. The tri-tip is a definite must-have. Vegetarians won’t be left behind thanks to the Teppanyaki style Mushroom Steak, and those looking for a more familiar flavor will be satisfied with its conventional version. Using beef cheek as the meaty goodness for a ramen normally associated with char-siu surprisingly works, and, again, ironically, sets Nomama apart from all the other ramen establishments. 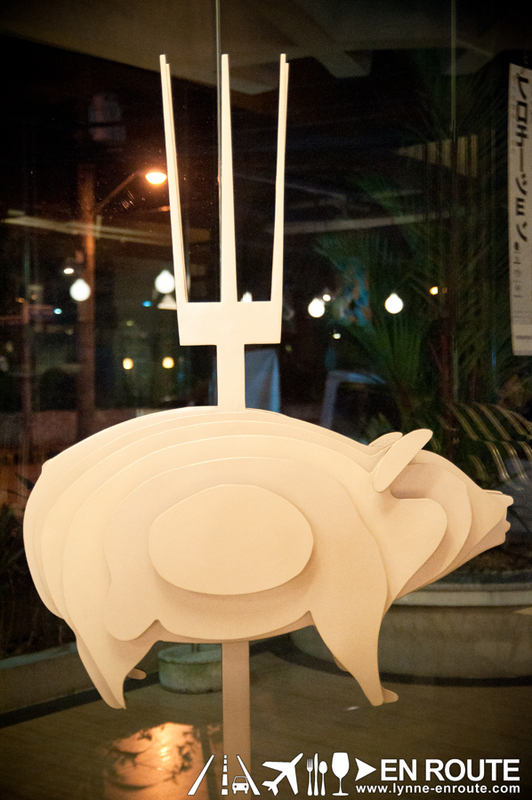 If tired with the traditional, all that is needed is but a thought to venture into something new, and a visit to Nomama in Quezon City will give a new perspective on what it means to be good at being unique.